Gongenmichi Road remaining in Gyotoku was built by Gongensama as to say Tosho Daigongen Tokugawa Ieyasu to go hawking in Togane in Kazusa province. After the Siege of Odawara by Hideyoshi Toyotomi in 1591, Ieyasu moved to Edojo Castle, and he developing Onagigawa River and Funaborigawa (Shinkawa) River as the canals to bring salt from Gyotoku to Edo. When he went to hawking, Ieyasu used both Onagigawa river and Funaborigawa river to go to east by ship and landed on Gyotoku, then he passed through Gongenmichi Road, then Onarikaido Highway from Funabashi Toshogu to Togane. Some researchers say that his journey to hawking was the inspections of his new territory and the demonstration of his power to samurai worriers and people in the territory. Anyway, Gongenmichi Road was built by Ieyasu Tokugawa to protect Edo and manage Kanto Region. Though Gongenmichi Road is only 2 meters wide and is cut off many places now, it is older than Gyotoku Kaido Highway and Naritamchi Road and there are many temples such as Myokakuji, Entonji, Jokanji, Seisanji, Honkyuji, Kyoshinji, Tokuzoji, etc., are along it, so it is a very important asset to tell us the history of Edo period. 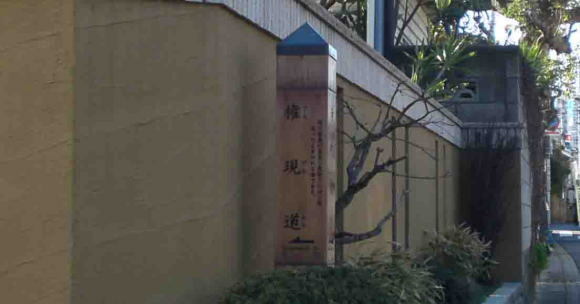 Even though It is in a residential area, visitors could find the history of Edo and enjoy sightseeings when they walk along it. It is a very unique course for a walk. Anyway the distances between temples are very short, you could find the next temple soon after leaving one. The stone paved road with many temples gives unique feelings to visitors to enjoy their trip. Moreover, some temples along it are belonging to the 33 Pilgrimage in Gyotoku and Urayasu. Why don't you visit Gongenmichi Road?